Hi, I had so much fun making this card! The theme at The Male Room is "Oriental" and it gave me the opportunity to pull out some unmounted plates I've had since the early 2000's from a stamp company called Non Sequitur. I'm also linking to the "Cards for Guys" challenge at Stampin' Royalty. I started by making the vertical panel by sponging various distress inks onto a piece of white cardstock. I then used the Crocodile stencil and Pumice Stone ink to add a bit of interest, before flicking some water onto the panel. Once I was happy with the result, I sponged Vintage Photo around the edges before stamping the Asian Text image three times down the panel, using my Misti for placement. The panel was then layered onto some black cardstock and then onto a Neenah Desert Storm card base. I then went looking for an Asian-looking sentiment and found the Ori Kami set by Altenew. 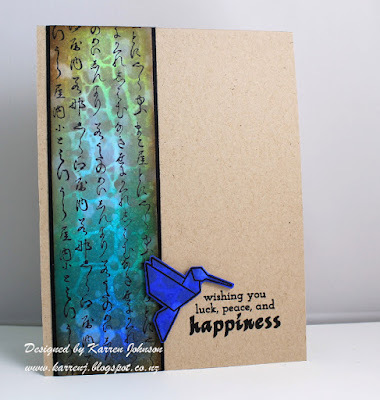 I stamped the sentiment onto the card base using black ink then stamped the bird onto a piece of white card onto which I'd smooshed Blueprint Sketch ink and then flicked water on. I fussy cut the bird and adhered him using foam tape. Edited to Add: This card got a shout out at The Male Room. I love your card. That panel has so much detail and the colours are gorgeous. The little blue origami bird really pops. Great work. Thanks so much for playing along with our Oriental theme at The Male Room! Deborah, DT. BTW - I think your son's painting is super! Holy moly is this cool!! composition is fantastic!! color choices amazing! Your card, priceless!! I just love it and thank you so much for sharing your outstanding talent. Gorgeous technique! I love the blending and adding detail with the crocodile stencil was a brilliant idea. What an amazing panel! Love how the colors seem to glow like water in the sunlight! This is soo pretty. And compliments to your son, he did a great job with your old watercolors. Your son did a great job on his watercolored image! 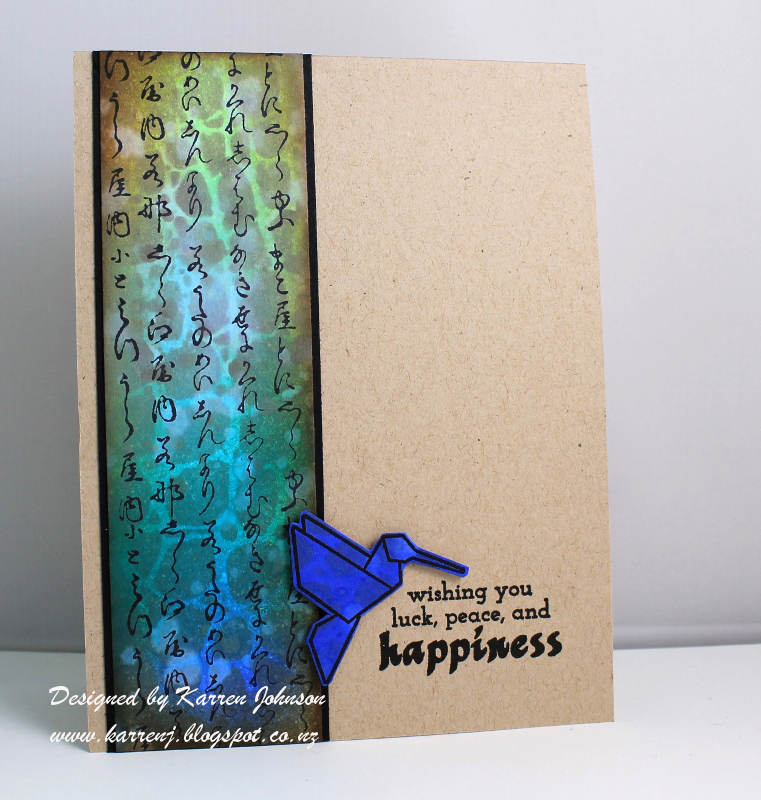 Your Oriental Panel is absolutely gorgeous, Karren! The blending of colors, fabulous pattern, and sideways text...WOW! 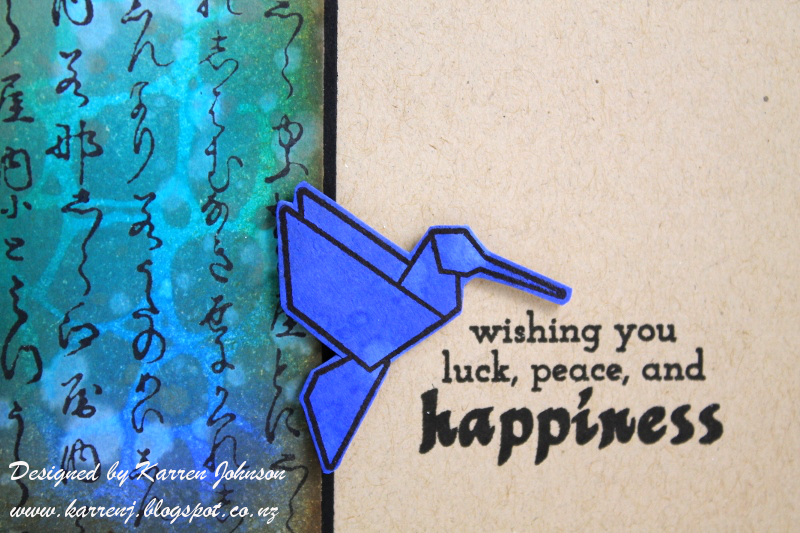 I love the crane, and that you backed it with two different neutrals, too! Really awesome masculine card!